With a cancer-fighting and superfood reputation long associated to its name, the small leafy watercress sure do pack an abundance of antioxidants, minerals, and phytochemicals to deliver on those health functions. Watercress also provides a power punch of vitamin A, C, E and K, calcium, iron, and potassium. The brimming essential nutrients offered by this little plant perform magical deeds to protect our eyes, liver, bones, skin, hair, and nails. 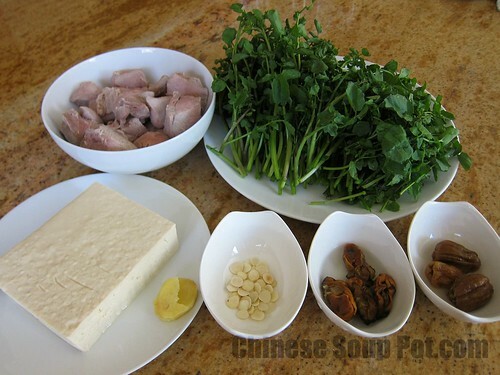 In Chinese medicine, watercress is a valued food remedy known to nourish the human body, detoxify the internal system, and remove excess internal heatiness. With so many health benefits offered by this modest-looking superfood, my parents regularly consume this vegetable in a delicious Watercress Tofu Dried Oyster Soup. Here, I share their recipe so you can enjoy it in your own home. It is easy to make and does not cost you a fortune either. A few inexpensive ingredients are put into a soup pot to cook for 2 hours. Really, it’s that simple. If you can’t be around the kitchen to “supervise” the simmering soup pot, you can also make this uncomplicated yet nutritious soup in a vacuum thermal soup pot. 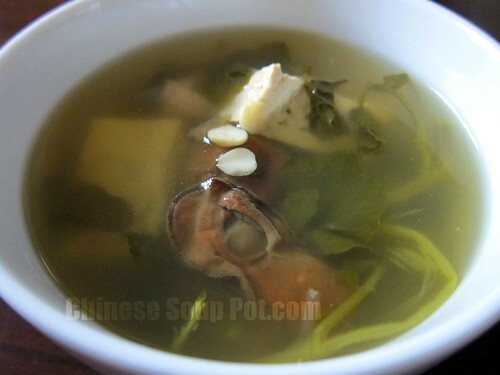 This soup clears internal heatiness, detoxifies, and nourishes at the same time. A great soup to have in the dry and hot summer days, as well as year round for cleansing. Rinse and soak the dried oysters and honey dates in cold water. Rinse the tofu block and cut into 1" cubes. Cut the pork to 2" chunks and blanch them in a small pot of water. Set aside. Bring 10 cups of water to boil in a larger pot. In the meanwhile, wash the watercress and cut crosswise in half if they are too long. When the water boils, add the ginger, dried oysters, honey dates, and blanched pork. Cook covered on high heat until the water boils again. Then lower the heat and simmer for 1.5 hours. Set the timer. When ready, add all remaining ingredients except for the salt. Cover and cook on low heat for another 45 minutes. Set the timer again. When done, add salt to taste, and serve. 1. See the watercress page in the Common Ingredients section for information on nutrition, health benefits, and buying tips.